You'll be £12.00 closer to your next £10.00 credit when you purchase The London DMS. What's this? 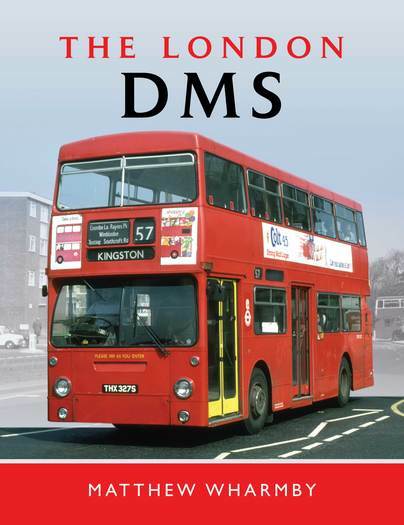 Vilified as the great failure of all London Transport bus classes, the DMS family of Daimler Fleetline was more like an unlucky victim of straitened times. Desperate to match staff shortages with falling demand for its services during the late 1960s, London Transport was just one organisation to see nationwide possibilities and savings in legislation that was about to permit double-deck one-man-operation and partially fund purpose-built vehicles. However, prohibited by circumstances from developing its own rear-engined Routemaster (FRM) concept, LT instituted comparative trials between contemporary Leyland Atlanteans and Daimler Fleetlines. The latter came out on top, and massive orders followed, the first DMSs entering service on 2 January 1971. In service, however, problems quickly manifested. Sophisticated safety features served only to burn out gearboxes and gulp fuel. The passengers, meanwhile, did not appreciate being funnelled through the DMS’s recalcitrant automatic fare-collection machinery only to have to stand for lack of seating. Boarding speeds thus slowed to a crawl, to the extent that the savings made by laying off conductors had to be negated by adding more DMSs to converted routes! Second thoughts caused the ongoing order to be amended to include crew-operated Fleetlines (DMs), noise concerns prompted the development of the B20 ‘quiet bus’ variety, and brave attempts were made to fit the buses into the time-honoured system of overhauling at Aldenham Works, but finally the problems proved too much. After enormous expenditure, the first DMSs began to be withdrawn before the final RTs came out of service, and between 1979 and 1983 all but the B20s were sold – as is widely known, the DMSs proved perfectly adequate with provincial operators once their London features had been removed. OPO was to become fashionable again in the 1980s as the politicians turned on London Transport itself, breaking it into pieces in order to sell it off. Not only did the B20 DMSs survive to something approaching a normal lifespan, but the new cheap operators awakening with the onset of tendering made use of the type to undercut LT, and it was not until 1993 that the last DMS operated. The author's forward expresses the hope that the book will become the definitive text on the DMS type. Indeed it should. and some pithy opinions to go with them. The work is accompanied by 9 photographs in black and white and nothing more and nothing less than 459 in colour. One pass. A curious and interesting subject and a visual documentation of the time of fable.